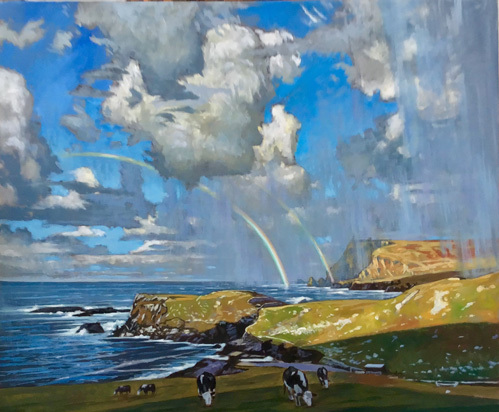 Brian Keeler presents a portrayal of the Celtic Coastlines and Hebridian Highlands- this show represents a return to his ancestral lands with a visual connection and an emotional relation to the land. The rugged western coastlines of Scotland and Ireland are presented here in this show at the North Star Art Gallery. Keeler traveled to the southwest of Ireland in the autumn of 2016 to paint over a dozen small plein air studies of County Clare and County Kerry. 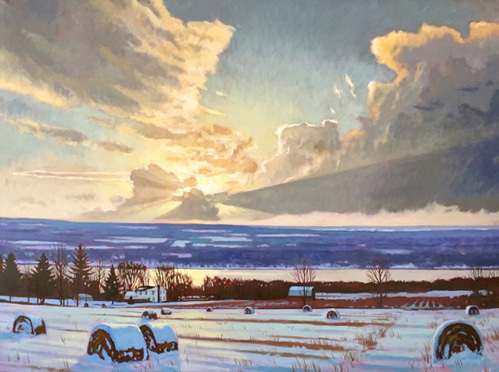 The drama of light, air, topography and sea are expressed here in small studies that record the landscapes with immediacy of the painting process necessitated when working en plein air. These intimate little paintings represent a visual shorthand to record the essence of locations with an economy of means to suggest his impressions. In Scotland, another two week trip in 2017 to the Outer Hebrides on the northwest flank of Scotland -these Hebridian Islands of Skye, Lewis and Harris provided the muse while there. The small Scottish coastal villages of Ullapool, Plockton and Achiltibuie offered the western facing evening light as the evocation to paint there and go further. 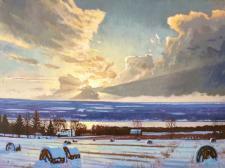 The North Star Art Gallery is just a few miles east of Cornell University in Ithaca, NY at 743 Snyder Hill Road. 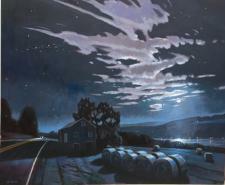 Www.northstarartgallery.com- check out this web site to preview the show. 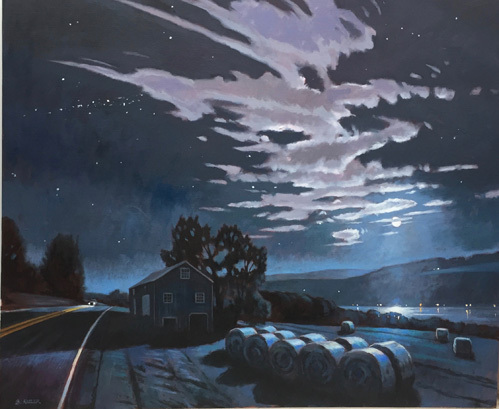 This oil painting of the Intersection on RTE 6 just west of Tunkhannock will be part of the show. "Church and Pumps" oil on canvas- 22" x44"
Join me for my open house at my studio in Wyalusing, PA on Saturday, May 5 from noon to 5. This is the first weekend of the new North Branch Arts Alliance tour of art studios. My studio is just off of RTE 6, turn at the traffic light on to Church and go one block- turn on to School Lane. Then its right there on the right. 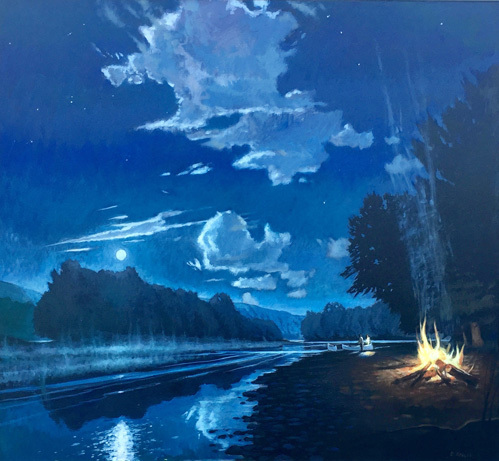 Moon Mist, Susquehanna Oil on linen 42" x 46"
The Summer Group Show at the FAN Gallery- Brian Keeler will be showing at the Fan Gallery again this Summer. He was in several shows there in the past and now returns with some new work. The FAN Gallery is located on 221 Arch St, just east of the Betsy Ross house. For Info fan@thefangallery.com The exhibit opens on Friday, July 6th from 5 to 8 and remains up until Aug 25. Look of the painting of the Ben Franklin Bridge by Brian Keeler nicely displayed in the window. Call the gallery at (215) 922-5155‬ for info.